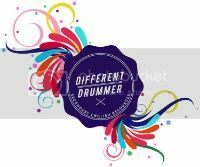 Different Drummer Secondary English Resources: Speech from a Graduate! I am a High School English teacher to adult felons in jail that usually have with ADHD, social/emotional disorders, general anxiety disorder, PTSD, and other learning disabilities. I am the mom to a 9 year old boy with ADHD and I have ADHD as well. This blog is a place for me to describe my teaching style, vent about the difficulties surrounding ADHD, and explain some of the common issues I face as a teacher and parent. finish up and attend classes every day as well as packets to fulfill any deficient units. 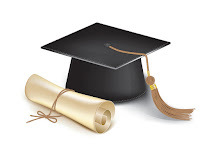 One of their last assignments is to write a graduation speech as a reflection on their journey and how this accomplishment will help them in the future. Some students use it as a platform to thank their teachers, parents, children, and anyone else that supported them on this journey and some take the time to really reflect on how earning their high school diploma will make a difference not only in their lives, but future generations. Here is one of the most beautiful speeches I have read from this year's graduating class. There is a question that comes to everyone’s mind throughout life and it's usually around ten years old and that is “When do we stop growing?” And there usually is an answer- like around 18-21 for women and 25-27 for men. This may be true height-wise and genetically, but that isn’t true for every aspect of life. 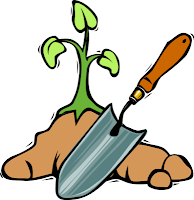 Truth is, we never stop growing because the power of education keeps planting seeds within ourselves that later grow into beautiful art we display in our lives. Education has no age limit. It’s a powerful tool that I believe to be the key to life because having an education empowers you to do things you never thought you could. Education becomes the bricks that pave the way to your dreams. It's the foundation to what you choose to build in life. It has no setting, no boundaries, no set age group, or no absolute definitive course. garden we carry around with us, continually planting seeds and watching it grow and morph into things we’ve only dreamed of and sometimes things we never expected. Continuing my education was always part of the plan, but as we all know, we always stray from the plan. It’s positive people in our lives that help us get back on track to continue reaching for the top to achieve more than we actually think we can. To the many teachers, professors, facilitators, mentors, guides, and to the people with optimistic views who enlighten us to search for more beyond our dreams and ourselves, Thank you. The lessons they bring to our lives go beyond their jobs and their titles when they invest in our abilities to strive for an education. To them I extend my thanks and my gratitude because they keep our dreams alive. They help you find something more, go deeper than you thought your could, and look for something you didn’t think you needed. And to my forever life teachers; my mom and my dad who have always been there for me even when I was not there for myself. Through my whole life, through grade school, high school, and even sports, as well as my upbringing of my own children, you have always been there to give me the words I needed, the confidence to overcome, and the overall support a son, a father, needed and will always need in life. I thank you now and forever. A special thanks goes out to my father, for not only being the example of a man I should follow but for showing me through his actions as a husband, as a father, and a man. He continues to pave the road by continuing his quest for education in his life, even in his late 40’s - sorry Dad! You have always been my hero, my life coach who I can always depend on to help me achieve my goals. It’s like in baseball when you coached me and said, “Son, you’d be a hell of a baseball player if you’d just follow through with your swing.” You see Dad, that applies to life and education because when you follow through with that you're sure to hit it out of the park. Thanks Dad for giving me strength and confidence to get back in the box and take another swing at life and at education. In closing, I would like to say thank you for allowing me to finish what I’ve started many years ago but most of all for enlightening me to follow my dreams through education. I now know that this is my story and I’m the narrator. In fact, we are all narrators to our own stories that will continue to move and change throughout our lives, never stopping, always continuing into the next chapter. It’s your story, you tell it. 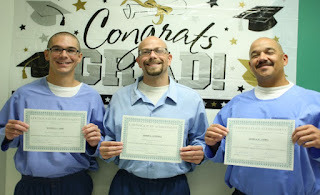 For all those who think spending money educating inmates is not worth it, think about this: if these guys finish high school, they have a 67% chance of getting a career that will stop the cycle of continuous incarceration for themselves, but more importantly, they have a 87% chance of stopping the cycle of generational incarceration. I think that this is so important to changing the way our society views felons and criminals. They can change. I believe it. I live it. I see it. Tweeting Shakespeare was A HIT! Shel Silverstein is the BEST poet EVER!